Score your goal in soccer and you may have won the game, even the championship. Hit your goal for your company and you can avert catastrophe, save thousands of dollars, and secure reliability for your company’s systems. How well does your company meet its energy, efficiency and financial goals? Do you have a workable plan in place guaranteed to meet high-performance, high-quality energy goals? Are you able to quickly identify the sources of potentially damaging disturbances as well as corrective action for those disturbances? Managers at Oracle Corporation, the software giant based in Redwood Shores, CA, asked these same questions regarding their own company. They were searching for a high-performance, high-quality electrical distribution system. Oracle wanted reliability, efficiency, safety, and support for their customers. They were able to find a solution with Schneider Electric’s EcoStruxureTM, an open, interoperable, IoT-enabled system architecture and platform. EcoStruxure delivers enhanced value around safety, reliability, efficiency, sustainability, and connectivity for Schneider Electric’s customers. 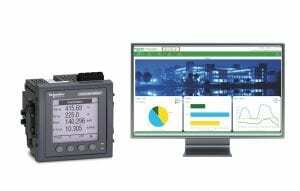 Let’s look at the alliance of Oracle and EcoStruxure Power Monitoring Expert and PowerLogicTM advanced meters. Oracle is the world’s leading supplier of information management software. Its products operate in everything from personal digital assistants to global information networks. So what were Oracle’s goals? Oracle serves thousands of software developers, as well as customers that depend on non-stop 24-hour-a-day technical support. For them, power interruptions can be extremely costly. “It can mean as much as $5 to $10 million per day for us in lost sales and productivity,” said Jeff Byron, former Corporate Utility Manager at Oracle. Oracle’s goals included a high-performance, high-quality electrical distribution system that supports customers and software developers with mission-critical needs. To meet those goals, Oracle deployed a full-featured power monitoring system from Schneider Electric that included EcoStruxure Power Monitoring Expert and PowerLogic advanced power meters. To secure reliable power, Oracle set up its own substation, a 13 MW electrical distribution system. Saving money would be an additional benefit. Their total budget was $6 million, with an estimated payback period of three years. That’s high-quality power with a fast payback. To reduce the risks of running their own electrical distribution, Oracle selected a power management system from Schneider Electric to meet their needs. Full-featured Schneider Electric PowerLogic meters were installed at the substation and the transformer of each critical building connected to the corporate Ethernet network by 10BaseT and 10Base FL links. With EcoStruxure Power Monitoring Expert software in place, they could easily access power system data. The software offers real-time control and monitoring that provides energy information, anytime you need it. Oracle valued the system’s scalability, affordability, and revenue-accurate metering. “There is an evolving need among commercial customers to want better power quality – and the ability to measure power quality is the starting point. With these meters it’s not that difficult to take the next step, and not just buy bulk power by the kilowatt-hour, but buy premium power one cycle at a time,” said Jeff Byron, former Corporate Utility Manager at Oracle. “When a present condition is reached, the meter sends an alarm to the software, a situation I can immediately see on screen in my office. If a fault hits when I’m away from my office, even at home, I get pages from the system within 30 seconds,” Byron continued. What other benefits for Oracle resulted from its partnership with Schneider Electric? The metering and reporting system has already helped the company identify sources of, and corrective actions for, many potentially damaging disturbances. The system measured more than 30 utility-side transient events in one year. The new system also delivered on the alarms set by Byron to trigger on undervoltage, and temperatures and oil levels in secondary transformers. This gives Byron a real-time view of critical loads. The power quality information also measures an Energy Service Provider’s ability to meet performance requirements.